The recommended time for a childrens party is two hours but you can also book Steve for an hour if you wish. Steve's party package is suitable for all age ranges, even the adults will find themselves getting involved. The two hour party starts off with a circus workshop as the children arrive so there is no waiting around for the entertainment to start. This includes teaching the children to spin plates and diabolos just like in the circus! Once they are fully circus trained, the disco and party games start and sweets are given out as prizes. The children are encouraged to join in the non-competitive games so noone is left out of the fun. The disco involves party dances such as 'The Fast Food Song' and 'Big Fish Little Fish' which are easy for the children to follow and take part in. Once the dances are over its time for you to feed the children with some background music still playing while we prepare for the second half of the party. 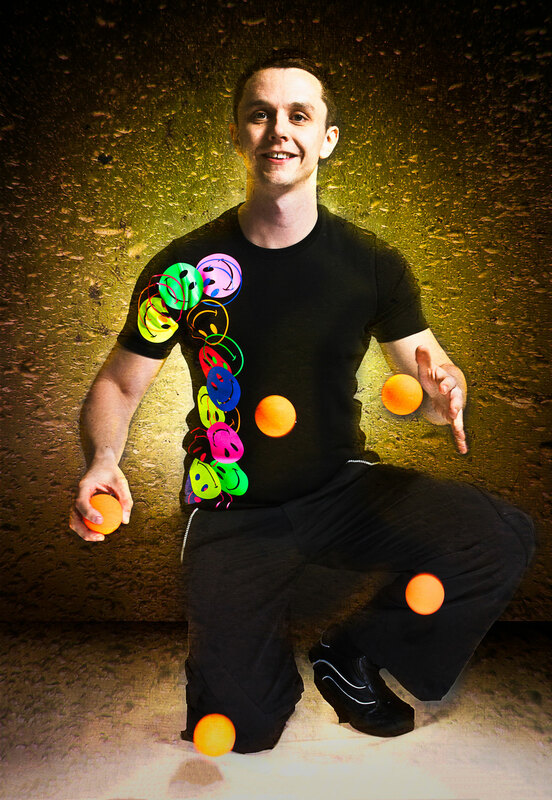 When they have finished eating Steve will help you present the birthday cake and encourage the kids to sing Happy Birthday and then finish the party off with his spectacular juggling show.